This slow cooker chicken dish is all about convenience. The combination of condensed soups makes a tasty sauce that is delicious served with the chicken, and it can be dressed up with some fresh herbs and extra shredded cheese. Parsley or chives would add extra color to the dish. Chopped pimientos or finely chopped bell pepper would be good as well. Or top the chicken with shredded cheddar cheese just before it's done. Take a look at some other ideas in the tips and variations below the instructions. Serve the chicken and sauce with hot cooked rice, noodles, or potatoes. Add a tossed salad for a satisfying family meal. Pat the chicken breasts with paper towels to dry; sprinkle with salt, pepper and garlic powder. Place the chicken breasts in the crockpot. In a bowl, combine the soups and pour over the chicken. Cover and cook on low for 6 to 8 hours, or until the chicken is done. The minimum safe temperature for chicken is 165 F.
If desired, top the chicken with some shredded cheese just before it's done. 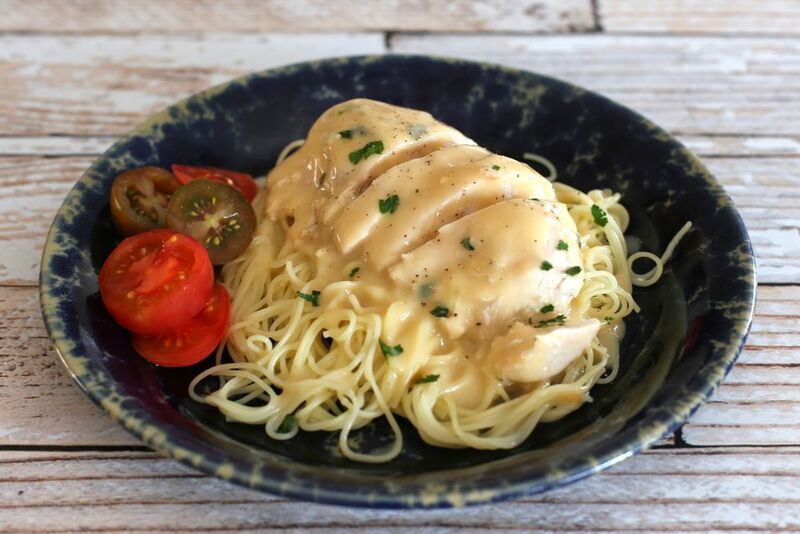 Serve the chicken with the cheese sauce over rice or noodles and garnish with fresh chopped parsley and shredded cheddar or grated Parmesan cheese, if desired. Use 2 cans of cheddar cheese soup and 1 can of cream of chicken soup for more cheese flavor. Replace the cheddar cheese soup or 1 can of the cream of chicken soup with nacho cheese soup or broccoli cheese soup. Omit the cheese soup and add about 1 to 2 cups of cheddar cheese 20 to 30 minutes before the chicken is done. Add chopped pimientos or finely chopped hot or bell peppers to the soup mixture.